If you like eating fruit in the morning you are going to just love the morning kiwi diet. With kiwis vitamin C and other health benefits there is no reason you are not going to want to eat a kiwi. Kiwis vitamin C is why you should eat a kiwi every breakfast. The morning kiwi diet like other replacement fruit diets makes a quick solution to weight loss allowing you to eat more in the evening while allowing your body to cleanse in the mornings. How good is kiwi for you in terms of vitamin C? Having kiwis and water for breakfast is what the Morning Kiwi Diet is all about helping you get you daily vitamin C in one fell swoop taking a healthy bite out of a kiwi. Now there is no need to hold back at the delectable calling your name. Eat a kiwi at breakfast and not have to worry about what you eat after. Check Kiwis Calorie and Nutrition Facts. Kiwis vitamin C combined with enhanced digestibility, advanced fat blocking, fatigue recover, constipation relief and excellent skin care, the morning kiwi diet is attractive for people looking to get more beautiful and healthy at the same time. In this next Slism we will bust open the morning kiwi diet in all entirety stepping past kiwis vitamin C going into details on the various benefits you get out of dieting on kiwis finishing off with some ways you can make your kiwi-backed weight loss plan work. What is the morning kiwi diet? The kiwi diet is where you eat 1 to 3 kiwis every day for breakfast with a glass of water in replacement of your normal breakfast eating routine. Other than that there are no strict dietary restrictions that you have to worry about making you hungry. Here are the only 3 rules you need to know to follow the morning kiwi diet getting kiwis vitamin C.
Avoid exposing the kiwis you are planning to eat to extreme temperatures by heating or freezing. It's best to eat your kiwi raw. Applying heat to the kiwi fruit you eat destroys kiwis vitamin C,reducing the nutritional valuein your kiwi that can easily be avoided by eating your kiwi in raw form. When you sleep the amount of body fluid you have stored away dwindles away into the surrounding environment. This is why as you wake up it is more than likely that you are going to be dehydrated to say the least. As important as getting enough fluids in your body first thing in the morning is, due to the fact that drinking ice-cold water drives down the core temperature of your body placing burden on the body slowing down your metabolism, drinking lukewarm water may be the best thing you can do for your diet. For your diet and health, rehydrate in the morning drinking water close to your core body temperature. Eating during the late hours of your biological clock is said to be a recipe for disaster only leading to putting on mass amount of fat and greatly affecting the quality of sleep you get decreasing your appetite you have after getting up. With no appetite during breakfast there lies a chance of developing a habit for skipping breakfast, thus increasing the amount of food you eat in the late hours of your day. The food that you eat late at night isn't all done digesting first thing in the morning like you would expect given that for most people this is between 6 to 8 hours. The morning is when your body flushes out the food that you ate the day before by kicking your intestinal function into second gear. 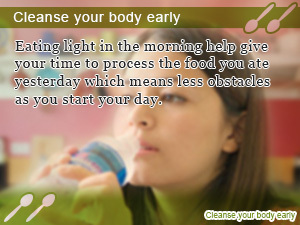 However, by eating breakfast in the morning it becomes necessary for your body to dedicate time to digestion taking away from energy you need for the cleansing process. Kiwi fruit is an excellent source of vitamins and minerals that your body needs to maintain optimal health. 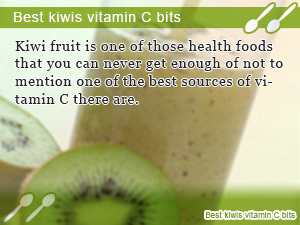 In fact kiwis vitamin C is exemplary even amount the Top 10 Vitamin C Foods. Just by eating 1 kiwi you get your daily allowance of vitamin C not to mention what it does to help with your skin. In addition to being one over the best sources for vitamin C out there, citric acid found in kiwis is said to help you recover from fatigue making proteins more digestible with more Actinidine in your diet. On top of that, another thing that makes the morning kiwi diet so attractive is how simple it is. Kiwi is a fruit readily available all throughout the year and requires almost no time to eat making quick runs out the door always on time eating a healthy kiwi followed by a cup of water. What's Wrong With The Morning Kiwi Diet? In reality no matter how much you may like eating a certain food, eating something every day is going to get old fast. One setback of the morning kiwi diet is that it's easy to get bored eating nothing but kiwis for breakfast with a glass of water. If you really want it to work out, the best thing you can do is substitute eating kiwi with another fruit. It's not enough to stress how important switching it up in your diet is for long-term success. Since there are 2 types of kiwi fruit you can choose from, namely the green kiwi and the golden kiwi, you shouldn't have too much trouble mixing it up with different kiwi varieties. Making juice out of kiwi is also recommended. 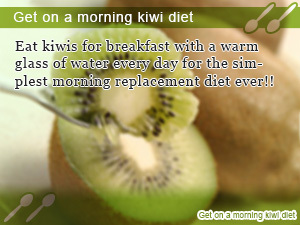 Eat kiwis for breakfast with a warm glass of water every day for the simplest morning replacement diet ever!! Kiwi fruit is one of those health foods that you can never get enough of not to mention one of the best sources of vitamin C there are. Eating light in the morning help give your time to process the food you ate yesterday which means less obstacles as you start your day.